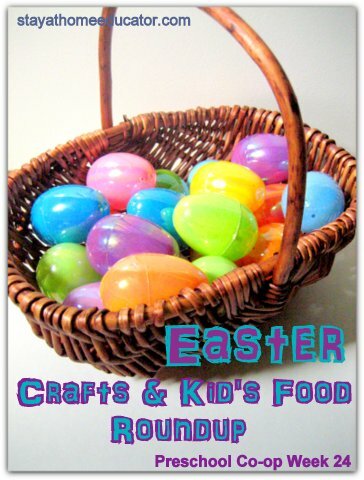 This week I’m featuring several of my favorite Easter themed kid crafts and food ideas. If you missed last week, I shared several Easter themed literacy activities, and Easter themed math activities the week before. At the end of this post you will find my phonemic awareness and phonics lesson plans from Preschool Co-op week 24. If you’re new here, check out my Facebook page and Pinterest boards, too. Easter “Cascarones” With a Twist – by Discovering the World Through My Son’s Eyes – Fill real egg shells with rice to make “confetti” filled eggs. DIY Spring Memory Game – by Fireflies and Mudpies – Use bird or Easter themed stickers and gift tags to make a portable memory game. Oil Pastel and Watercolor Easter Egg – by Buddy and Buggy – Use oil pastels as a wax resist for watercolors to create wonderfully colorful Easter eggs. Fancy Egg Shakers – by Mama Smiles – Fill clear plastic eggs with colored sand or poly fill and seal tightly with electrical tape to make fun musical shakers. Easter Bunny Craft – by Nurture Store – Use toilet paper rolls to make a family of bunnies. Egg Carton Chicken Egg Cups – by Red Ted Art – Add a comb and some feathers to egg carton pieces to make some very creative egg cups. Resurection Craft – by True Aim – Use the provided template for a craft to help children remember the history of the Easter holiday. DIY Salt Dough Easter Eggs – by Powerful Mothering – Make brightly colored salt dough eggs and a paper mache nest to house them. Modge Podge Easter Eggs – by Creative Connections for Kids – Use tissue paper and modge podge to make brightly colored Easter eggs. Flower for Tots – by Seeking Shade – Make flower pots using play dough, play dough accessories and Easter trinkets. Scratch and Glitter Eggs – by Blog Me Mom – Color dying eggs with crayons, then paint black and scratch off the dried paint to revile the colors underneath. Easter Napkin Rings – by East Coast Mommy – Paint cut down toilet paper rolls then decorate with stickers to make festive napkin rings. Coffee Filter Flowers and Butterflies – by Craftulate – Color coffee filters with water soluble markers and then use an ege dropper or wet paintbrush to blend to colors. Cut into shapes. Painted Easter Cookies – by Putti’s World – Use a q-tip to apply diluted food coloring to paint frosted shortbread cookies. Recipes included. Easter Lollipops – by Nurture Store – Make festive lollipops using a rice cereal treats. Recipe included. Carrot Pizzas – by Crafty Moms Share – Top an unrolled, unbaked croissant with chopped carrots and broccoli to make carrot pizzas. Easter Lamb Lunch – by JDaniel4’s Mom – Make a cute Easter lamb for lunch. Ingredients needed include cheese, olives, celery, Cheerios, bread and more. Easter Sugar Cookies – by Plain Vanilla Mom – Try these little sugar cookies that don’t loose their shape once cut! Recipes included. Easter Peep Pops – by Mess For Less – Use Peeps candies to make pops. Very kid friendly! Phonemic Awareness Skills: Review – This week students reviewed all previously taught skills, including rhyming, blending onset and rime, and phoneme isolation. Change the i to o. What word did you make? Change the h to a. What word did you make? Change the o to a. What word did you make? Change the p to t. What word did you make? Change the m to p. What word did you make? Change the a to o. What word did you make? Change the p to g. What word did you make? Hi Tracey! This is a very old post and doesn’t include any of my own printables which is why you won’t see my download button with my house logo on it. The printables would be in the in-text links. But if you can’t find them there, then the blogger must have removed the printables from their sites. Sounds like I need to update the post!